You have probably heard that dogs are at risk for heat stroke when they are in hot temperatures. Fortunately, you can take steps to prevent heat stroke and keep your dog safe. Heat stroke is a condition that is caused by a elevation in body temperature called hyperthermia. This body temperature increase tends to occur as a response to a trigger like inflammation in the body or a hot environment. When a dog is exposed to high temperatures, heat stroke or heat exhaustion can result. Heat stroke is a very serious condition that requires immediate medical attention. Once the signs of heat stroke are detected, there is precious little time before serious damage or even death can occur. Dogs do not sweat through their skin like humans; they sweat small amounts through their foot pads and nose. Unfortunately, this not enough to release excessive body heat. 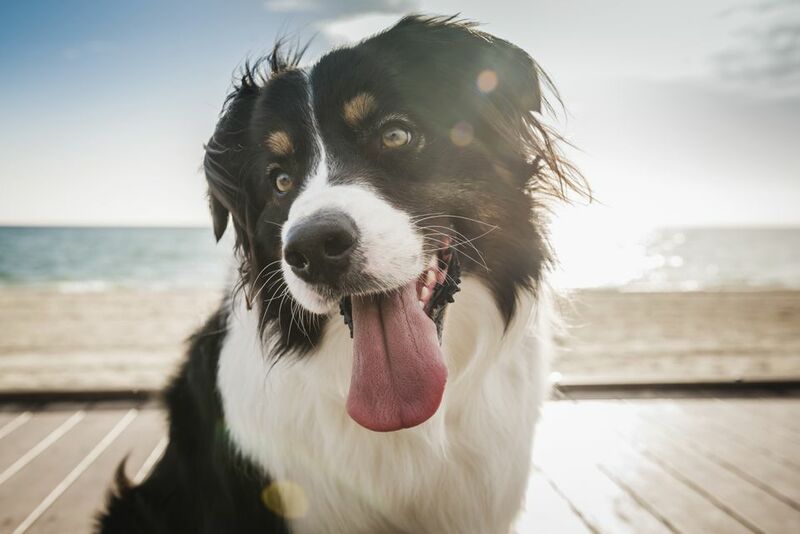 Dogs primarily release heat by panting, a method that exchanges hot and cool air. Unfortunately, this is not a very effective or efficient process, especially when the body temperature is very high. If a dog cannot expel heat, the internal body temperature begins to rise. Damage to the body's cellular system and organs may become irreversible once the dog's temperature reaches 106°. Unfortunately, too many dogs succumb to heat stroke when it could have been avoided. Learn how to recognize the signs of heat stroke and prevent it from happening to your dog. If you have even the slightest suspicion that your dog is suffering from heat stroke, you must take immediate action. Contact your vet as soon as possible for advice about the steps you need to take. If you have someone to help you, it may be best to head straight to the nearest open veterinary hospital while attempting cooling methods. Or, have one person cooling the dog while to other calls the vet for help. It's important to carefully lower your dog's body temperature. First, move your dog out of the heat and into a cool, shady area that is well-ventilated. Offer your dog cool water, but do not force water into your dog's mouth. Try not to let your dog drink excessive amounts at a time. Begin cooling your dog's body temperature using cool water. You may place wet rags or washcloths on the foot pads, around the head, on the abdomen, and in the armpits. Replace the cool towels frequently as they warm up. Avoid fully covering the body with wet towels as it may trap in heat. You can use a fan to help provide cool air. DO NOT use ice or ice water. Extreme cold can cause blood vessels to constrict, preventing the body's core from cooling and actually causing the internal temperature to rise further. Over-cooling can also cause hypothermia (low body temperature) leading to a host of new problems. When the body temperature reaches 103.9°F, stop cooling. At this point, your dog's body should continue cooling on its own. Visit a veterinarian as soon as possible, even if your dog seems better. Internal damage might not be obvious to the naked eye, so an examination is necessary. Further testing may be recommended to assess damage. There's no doubt that heat stroke is a life-threatening condition. Fortunately, there are ways you can prevent heat stroke from happening in the first place. NEVER leave your dog alone in the car on a warm day, even if the windows are wide open. The inside of the car acts like an oven in the sun and heat. Temperatures can rise to dangerously high levels in a matter of minutes, even if the weather outside is not extremely hot. Remember that certain types of dogs are more sensitive to heat, especially obese dogs and brachycephalic (short-nosed) breeds, like Pugs and Bulldogs. Use extreme caution when these dogs are exposed to heat. Do Dogs Know When to Take a Break in the Summer Heat?